Great genre films come from great scripts. Great genre scripts come from great concepts. Wasteland world where oil is scarce and motor cars are status symbols? Great concept. An alien hides inside human hosts, attaching spaceship crew members? Great concept. 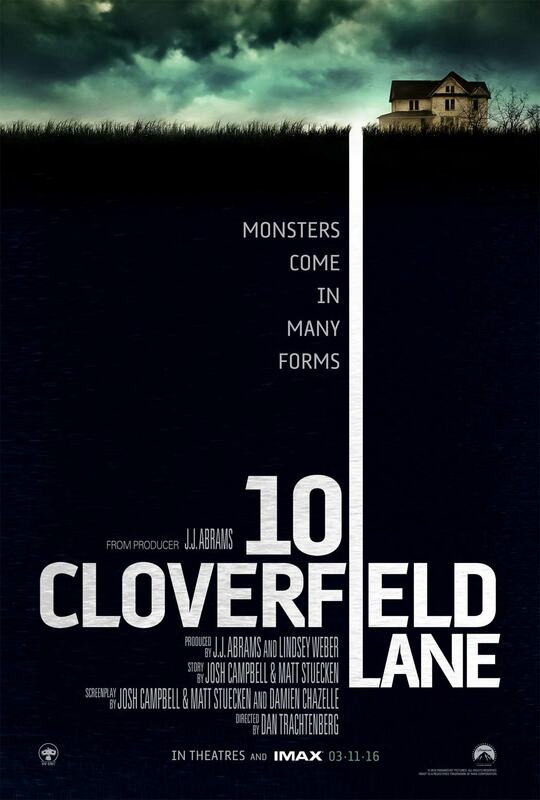 10 Cloverfield Lane has a great concept too. Mary Elizabeth Winstead stars as Michelle, a woman on the run. After a car crash, she wakes up inside an underground bunker, with Howard the bunker's owner. Howard, played by John Goodman, refuses to let Michelle leave claiming the surface has been irradiated from some sort of attack. Cell phone service and the radio are down. Has Michelle been kidnapped or Howard telling the truth? If you were locked in the basement with an off kilter man who said the outside is toxic, what would you do? The first act plays as one might expect. The audience gets a feel for characters. The menace is established as Michelle tries to figure out what is going on. It's a little predictable. The second act builds the tension just as it's supposed to, deepening the secrets of the film's world. 10 Cloverfield Lane's set up leaves one of two options for an ending: Howard is a pervert or Howard is telling the truth. Somehow the film finds a third ending. The third act goes absolutely bonkers insane, in the most perfect genre movie way. What could have been a rote thriller ending, turns into an intense crescendo. Mary Elizabeth Winstead has always been a fantastic actress, and she excels here. While Faults may be her thriller crown-jewel, here she is a likable everywoman with just enough pathos and resilience to keep the audience hooked. John Goodman is an inspired choice for Howard. Best known for his genial persona, Goodman walks a fine line between slightly off-kilter conspiracy nut and true psychopath. Were it not for the backing of Hollywood hit maker JJ Abrams (of Star Wars fame), 10 Cloverfield Lane would be tearing up the midnight selection on the film festival circuit. It isn't a perfect film, but it is a good time at the cinema for fans of Twilight Zone-style setups. 10 Cloverfield Lane is supposedly a "spiritual sequel" to the 2009 film Cloverfield. This film is only tangentially related to the original, if related at all. It is certainly not necessary to see it to enjoy this one. 10 Cloverfield Lane was directed by Dan Trachtenberg, his first feature film. The script was written by Josh Campbell, Matthew Stuecken and Damien Chazelle.